When fellow Filipinos from then Senator Gloria Arroyo (one of the early,enthusiastic proponents of us joining or signing on the 1995 WTO Agreements) to our influential native technocrats - all probably with vested interests in the perpetuation of WTO Agreements/Rules and brainwashed with the "free-market" economic system of Adam Smith-- talk of a "level playing field" in the global trade, I try hard to humor myself because I find these traitors to our native people disgustingly enraging. These fellow Filipinos continue to fool and keep the native majority ignorant. They continually mislead us into believing that we, impoverished people of an underdeveloped country, are in a horizontal or equal relationship with the rich, powerful and advanced industrialized nations, all supposedly friendly competitors in the globalized market. Common sense and reality show us that the 14-year results of WTO in the Philippines signed into by our homeland's leadership since the Fidel Ramos presidency, continued by then Estrada and current Arroyo regimes have only hastened our national de-industrialization (whatever industries, however light and little we had) and agricultural deterioration. Their combined consequences being the loss of work for millions of native Filipinos --to join the ranks of the poor and the worsening impoverishment of the native majority. A serious study of the national histories, or more precisely, of the histories of national economic development of rich/developed nations, will demonstrate that they neither believed nor practiced "free-market/free-trade economies." All of them-- England, the United States, Western European countries, Japan --lied about how they became what they are today --if looked at under their now proselytized model of "economic globalization" aka "economic liberalism" aka "free-trade" via rich nations-controlled WTO rules (more aptly, neoliberalism or neocolonialism). For 150 years, England practiced economic protectionism in agriculture and industry. So did the United States after Alexander Hamilton, a Founding Father, wrote that America should encourage national industrialization with subsidies and tariffs; Japan did so for 100 years. And they continue to do so since "they", the developed/rich nations with their transnational corporations (TNCs), define and lay down the WTO Agreements. They do it to us via their arm-twisting enforcers, i.e. the IMF and WB As the saying goes: "He who has the gold, makes the rules." Native Filipinos, especially the so-called educated (whether from our local universities, private and public, or from abroad) have been bombarded about the "free trade" gospel as the only way to national development and the "invisible hand" of the free market. No one seems to have heard of Friedrich List, the leading critique of Adam Smith's "free trade" gospel (include me after an MBA from UP). We Filipinos need to learn, understand and realize that the past, present and popularized "free-trade" aka globalized economy will not lead to our own, our children and grandchildrens' long-term betterment. We Filipinos all need to know that our economic deterioration, especially in the last 35 years or so, has been facilitated by religiously following developmental rules/theories, whether from Walt Rostow's Stages of Growth, Smith's Wealth of Nations, and the latest spin of "globalization" (which condemns nationalism and protectionism of poor countries) formulated by the rich and strong nations. Global economics is not about friendly countries fairly doing business, it is about the strong countries screwing the weak countries. The following article (I shortened this one) provides a good introduction on how the strong nations enriched themselves and how they now continually do so at the expense of the weak (thus continually poor) ones. I have linked a website for a Filipino NGO, i.e. Fair-Trade Alliance that promotes the re-imposition of higher tariffs for imports that compete with local products and lower tariffs for imports not locally produced. However, such efforts need to have the native majority educated for nationalism to be successfully realized. In her early development, Britain structured her laws to protect her industry and commerce. The British Enclosure Acts of the 15th, 16th, and 17th centuries were sparked by the labor shortage created by the Black Death and the need for sheep farming to produce for the wool market created by the Hanseatic traders. As opposed to today’s industry fleeing from high-priced skilled labor and moving to cheap labor, skilled artisans of almost every product in world commerce were brought to England from all over the world to train British labor in those skills. Bounties were given to promote exports of manufactures. And custom duties were enacted to protect those new industries. Dutch commerce was undercut by the Navigation Acts requiring British products to be transported in British ships. English warships attacked Dutch shipping and English exports and imports rapidly increased. The Methuen treaty of 1703 with Portugal shut the Dutch off from trade with the Portuguese Empire. A small quantity of manufactured produce purchases a great quantity of rude produce. A trading and manufacturing country, therefore, naturally purchases with a small part of its manufactured produce a great part of the rude produce of other countries; while, on the contrary, a country without trade and manufactures is generally obliged to purchase, at the expense of a great part of its rude produce, a very small part of the manufactured produce of other countries. The one exports what can subsist and accommodate but a very few, and imports the subsistence and accommodation of a great number. The other exports the accommodation and subsistence of a great number, and imports that of a very few only. The inhabitants of the one must always enjoy a much greater quantity of subsistence than what their own lands, in the actual state of their cultivation, could afford. The inhabitants of the other must always enjoy a much smaller quantity.... Few countries ... produce much more rude produce than what is sufficient for the subsistence of their own inhabitants. To send abroad any great quantity of it, therefore, would be to send abroad a part of the necessary subsistence of the people. Always to favour the importation of productive power, in preference to the importation of goods. Carefully to cherish and to protect the development of productive power. To import only raw materials and agricultural products, and to export nothing but manufactured goods. To direct any surplus of productive power to colonization, and to the subjection of barbarous nations. To reserve exclusively to the mother country the supply of the colonies and subject countries with manufactured goods, but in return to receive on preferential terms their raw materials and especially their colonial produce. To devote especial care to the coast navigation; to the trade between the mother country and the colonies; to encourage sea fisheries by means of bounties; and to take as active a part as possible in international navigation. By these means to found a naval supremacy, and by means of it to extend foreign commerce, and continually increase her colonial possessions. To grant freedom in trade with the colonies and in navigation only so far as she can gain more by it than she loses. To grant reciprocal navigation privileges only if the advantage is on the side of England, or if foreign nations can by that means be restrained from introducing restrictions on navigation in their favor. To grant concessions to foreign independent nations in respect of the import of agricultural products, only in case concessions in respect of her manufactured products can be gained thereby. In cases where such concessions cannot be obtained by treaty, to attain the object of them by means of contraband trade. Thanks for enlightening us, Bert. I say Free Trade is a very profitable racket by the dominant capitalist countries. I hope our candidates for 2010 get to read what you wrote. It appears from their early pronouncements that it is only Mar Roxas, the LP candidate for president, who understands fully the evil implications of globalization to our people and country. Under capitalism, there is an aspect named "competition" that negates the vaunted claims of the stronger countries of the benefit of free trade to the weaker trade partners. Free trade with competition as the operating mechanism can never be free; it favors always the better competitors. And who but the developed countries are the better competitors! Western capitalism or capitalism after undergoing crisis after crisis in the past two decades have opened itself to big questions that doubt its efficacy as the world system that will bring the good life to every one living in this planet Earth. What has it done for the world, Bert? Take a look at these stats: Worldwide capitalism has organized a society where 20% of the population possesses 80% of the wealth on our Earth; The three richest people in the world have assets greater than the combined wealth of the 40 poorest countries, where 600 million people live; 257 individuals alone accumulate more wealth that 2.8 trillion persons, equivalent to 45% of humanity. Capitalism records itself in our history as only for the few rich and has damned the rest of humanity. Where has the wealth in capitalist Christian RP gone to? Well, the known answer for ages is: 10% of the people owns 90% of the wealth while the 90% of the people has to slug it out for the remaining 10%. We have an inequitable economy that favors a few while the welfare of millions of Filipinos is negleted. It is reported by Forbes Asia that the combined wealth of the 40 richest Filipinos is $17 billion (P773.5 billion at P45.5:$1), which is equal to the total incomes of nearly 60 percent of Filipino families or almost 52 million Filipinos, Whew, well then, ah, but still, to compound our miseries, we want free trade and welcome competition, no protectionism, in our very shores from the stronger nations. With such a low score for success of capitalism in our country, why do we still want to be dictated by the global capoitalist experts to continue opening, wider and wider, our markets to foreigners? It seems it is not only ignorance that has kept us in pits. It is also the lack of courage to go it alone without the dictation of supposedly globalization brother-experts that in the last crisis have shown to be bankrupt of the technical means to prevent its major flaws. These experts has still to find the likely cause that will exonerate them that they can confidently sell to the gullible public - mostly found in developing countries like us. Have a good day, Bert. Thank you too, Ogie for sharing the posting with your friends. Yes, it's a combination of ignorance of the impoverished majority and the short-sightedness (hopefully honest) of the decision-makers. My conversations with some American-educated fellow Filipinos always confirm the impression that they believe lock, stock and barrel the capitalist gospel of "free trade" and all its current variations in time. They see no other alternative approach to political economy. Sadly and unfortunately and thanks to our colonial mentality, these Americanized minds oftentimes become our professors in our state and private colleges/universities thus contribute to the tunnel vision and perpetuation of the "free trade" gospel. Or as technocrats continue implementing anti-Filipino policies that are disastrous to the native majority and society as a whole. Of course, communism in practice, as we all know, was the god that failed. It is safe to say that "isms" carried to the their absolutes tend to fail in the long-run; all of them, economics --in our present discussion, have to be studied, understood, modified and updated according to the specific circumstances as in our underdeveloped stage. For us, whether capitalism or communism or a mixed economy can potentially be beneficent to the native majority if mass social consciousness or nationalism is the foundation. Coming back to present realities, mass education flavored with Filipino nationalism can lead to unity and action to force our decision-makers to work for the common good rather than for their foreign masters-native partners and their selfish interests. Thank you for your essay on free trade? How come most economists in our country embrace this theory that is clearly against our national interest? How come that colleges and universities preach free trade as if it were biblical truth. Don't their administrators and professors read history? It is all there. Or are they foreign agents? This is just a short note to let you know the implications of protectionism, whether in the form of high tariff barriers or non-tariff restrictions on selected goods. What it essentially means is that consumers will pay a higher price for (protected) goods than they would pay under a 'no barriers' free trade regime. The price difference is therefore effectively a tax consumers pay that goes directly to the pockets of privileged businessmen (often cronies of politicos whose influence allows them to get protection for their industries usually through the 'nationalism' argument). Thanks Rene, you are right about a certain evil aspect of protectionism - indirect "commissioning" thru the crony capitalists. Certainly there will be times when we are less corrupt that we may be able to reap the good that protectionism gives to local manufacturers, unless all of our producers have turned to be the agents or partners of "invading" manufacturers. When the time comes that cheaper imports harm our local producers thereby injuring our economy, then I believe it is time to really think about the merits of protectionism. I think the time has come. Whether we have protectionism or free trade, private and public corruption will be there. It seems we have all been led to believe that corruption is only in the public sector, in government, i.e. in USA, ENRON, WORLD.COM, ARTHUR ANDERSEN, current financial fiasco, etc.I have not followed much domestic news back home but you may know about our local and private counterparts. Corruption is a matter of degree, sadly ours has become extreme since the Marcos Dictatorship. We can ignore the petty corruptions by ordinary people/workers given that these are driven by: low income, high prices of necessities,etc. I think there is a certain level above absolute poverty, which is characterized nowadays as $1-2/day for a family of 4 and we now have 40-65% (?) where petty corruption may start to recede; We can not expect starving people to not sell their votes for example. Public corruption (in government/military) has become massive and open, stolen money are hoarded out of the country (just like profits are now 100% repatriated by foreign companies as allowed and enforced by our signing with the WTO). Thus, more $-capital leaves our homeland. Sure there will be corruption but it would be easier to deal with since nationalistic policies will install and enforce foreign exchange controls to stop capital flight (as Pres. Carlos Garcia did or as the Asian Tigers and/or other Asian nations did: Japan, Korea, Malaysia or Indonesia). If corrupt natives are kept in check, they will be forced to invest domestically as in Indonesia and thus creating jobs in the homeland! 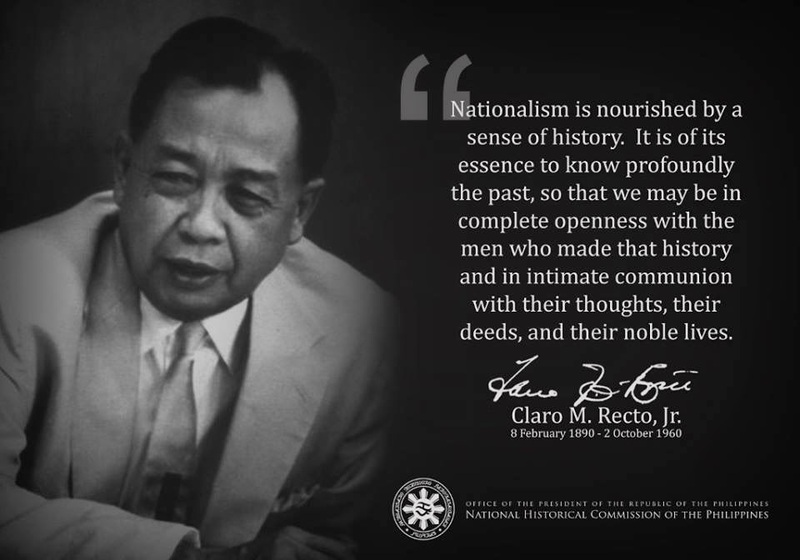 The task, albeit much more difficult nowadays due to cultural globalization on top of our already damaged culture, is to instill/revive our Filipino nationalism --the main reason for my ranting. It is expected and understandable that protectionism -coupled with foreign exchange controls- which we practiced to a substantial degree led to some corruption. A serious study of economic history will show us that this is a truism (USA, Britain, etc.). But let us not forget too that it was during these times from the 1950s till the late 1960s that we developed to become 2nd to Japan thanks to our native entrepreneurs (I worked for a native Filipino family corporation which was progressive in the chemical industry,in terms of technology/knowhow and treatment of employees --surely better than the resident Chinese entrepreneurs). The Japanese sell their products expensively domestically and cheaper abroad. Have they suffered? No -as of this writing Japan is still the 2nd largest economy in the world. I find them very nationalistic and protectionist in most of their industries; so are the Koreans,Taiwanese, and less protectionist as they arrive at a more competitive stage in most capital and heavy industries. But note still their farmers rioting against agricultural imports, etc. With the foreign debt plus opening up of our country as dictated by our lenders IMF/WB via WTO rules and our unFilipino rulers, our homeland has been economically devastated (industry and agriculture). And corruption became massive and flourished. Nobody is claiming that corruption exists only in the public sector. In fact, corruption requires the engagement of parties in both the public AND private sector. The thing, though, about the corruption of public officials is that this entails the use of government power for private ends and misuses public resources. So, in addition to tariff and non-tariff barriers on the importation of goods, you also want capital controls? In effect, you are proposing a closed economy like Burma and North Korea? Such a tightly-restricted economy of course implies strong-arm controls to keep the populace in check, i.e., military control. Good lord, if that is your model for economic paradise, I only request that you let me out of here when you take over government. My problem is that you define "nationalism" as protecting local businessmen. What about local consumers? You effectively tax consumers (by making them pay higher prices) so that local businessmen will make more money. So, you are taking from the pockets of poor consumers to give to the local businessmen/cronies who can get government officials to give their industries protection. I really don't know how you reach this conclusion. Protectionism will make it easier to eliminate corruption? Don't you think all the restrictions will simply create MORE opportunities for corruption? Further, you propose to FORCE businessmen to invest so that jobs will be created? What kind of society do you have in mind? Firstly, I do not have any problem with your interpretation of corruption. Secondly, I do not know why you jump into the conclusion that I want a closed society as you alluded to. But it's understandable. We Filipinos tend to think in Manichean terms, black or white, etc. Nothing in shades of gray where most life is all about. I do not know what your age is, but till GMA's dad Dadong became president in 1962 (thanks to American businessmen/US gov't support since he promised them complete decontrol) our government had foreign exchange control in place. Were we like North Korea or Burma then? Several Western and asian countries had exchange controls then. With the signatories of WTO, all these were removed. And what happens, the moneyed individuals,i.e. George Soros, etc. and the transnationals/multinationals can move 24/7 their money in and out of any country. Ergo, the Asian financial crisis. And the wild fluctuations on stocks, currencies, futures, commodities, etc. Thirdly, where did I define nationalism = protecting only Filipino businessmen? A nationalistic people will not let his kind or any foreigner to screw him. Of course, a nationalistic people will provide preference to his fellow countrymen/entrepreneurs IF latter deserve them, i.e. have "can do, will do" with government help. That's how other advanced countries came to be. Until they have become competent and competitive to go out into the world. I am not for the protectionism of the old ways, of the oligarchs or aristocracies of years ago. Lastly, if you are serious enough to understand, look into what other Asian countries who overtook us dealt with corruption. That's what MLQuezon alluded to (though he said so as a politician)about his preference that our country "being run like hell" by his kind (fellow Filipinos). Because by implication, we can learn through our own mistakes AND we can control fellow countrymen easier than foreigners when push comes to shove. Bakit nababaon sa utang ang Bansa (na Ginagarantiyahan ng Gobyerno)? makinarya't kagamitan na lubhang kailangan sa panahon ngayon..
mga produkto ng salapi natin halos mga alak(San Mig),saging at kawayan lamang. na siyang paborito at nakasanayang wika ng ating mga dalubhasa/intelektuwal. Imperialism has evolved from hard power to soft power to smart power. The only way capitalism survives is through the constant mutation through societal arbitrage. The exploitation and oppression has already been transmitted to future generations to keep the capitalist system alive. THE ABILITY TO CREATE MONEY IS THE RESULT OF SOVEREIGN POLITICAL POWER. IT REQUIRES ECONOMIC POWER TO BECOME SOVEREIGN..
strategy when it is only a tool or tactic. Protectionism is the same. It is only a policy tool but the underlying belief system or philosophy is dirigist mercantilism. That evolved naturally when communities would protect their resources for themselves. The emergence of devices to raise productivity led to a surplus that led to an exchange economy that gave rise to the invention of portable mediums of exchange. Money is the most simple form of derivative. Communities then later learned to regulate its use as technologies gave rise to a more diverse and specialized division of labor. As I have indicated in the earlier response above, many of(if not most and preferred by) our university/college professors are American-educated fellow Filipinos. Sadly and unfortunately and thanks to our colonial mentality, such contribute immensely to the tunnel vision and perpetuation of the "free trade" gospel. Or as technocrats they continue implementing anti-Filipino policies that are disastrous to the native majority and society as a whole. Salamat sa iyong kumento at sa paggamit ng ating sariling wika. Sana ipasa mo sa iba ang iyong isipan kasama na ang mga topics gaya nito. Buti at isang mungkahi mo ay pagbasa ng mga sinulat ni Renato Constantino. Gaya ng sinabi mo, maraming malalalaman mula kay Constantino, isiang tunay na Pilipino. Yes, protectionism is a government/official policy designed to protect native, infant industries, native businesses until they flourish and able to face the world so to speak. It can be used whether one is following communist, socialist, capitalist or mixed economy. The bottom raison d'etre is to develop a strong national agriculture and industry before anything else. And the strongest motivation for such would be nationalism. Last time I responded to your email was when you were still quoting Jose Rizal on "Ang hindi marunong lumingon sa kanyang pinang-galingan ay hindi maka-ra-rating sa kanyang patu-tunguhan" Something to that effect. Which I am not mistaken is very similar to a quote in the movie "The Last Samurai" 1800 circa. I wonder, who said it first. Have you ever tried figuring out why hindi na mai-sa-sauli ang buong province ng Rizal, all the way up to the north of Pampanga sa Tundo Province, while Tondo is left to what it is today? The answer lies in the topic of discussion. Let's talk about your subject "Protectionism and Free Trade". I am not much of a reader, but more of an observer. Have you ever looked at how India has progressed to where it is now, with more than 18 billionaires and counting, most of them in hi-tech. These, in just over 60 years of independence, after British protectionism for hundreds of years. How about China, which holds a bigger infrastructure, with 1.6 billion in population, less than 5 individuals are billionaires, with the market opening up only in the early 1980s. What is the difference between the two of them? While you may be able to count those in the Philippines, how many Filipino billionaires and $100M+ mllionaires are there outside the Philipines. What makes one different from the other? Protectionism and Free Trade are on the opposite sides of a coin. You pick which one you want. And if the coin ends up standing, embrace the unexpected. In the meantime, try to figure out how to feed the newly borns of the last 10 years. Provide lasting values to those who were born another 10 years back. Create employment to the shelter providers (the parents) and come up with a solution, caring for those who are 70 and over. The First World countries, have created their own working model, 5/10/15/20 years at a time, close to 500 years now. In the Philippines, there is a working model. With it, you can ride and claim your keeps or you can keep criticizing. The Philippine population was 35 million in 1975, now it is about 90 million. The working model, designed in 5 year increments, evolves to its needs to 2050 and beyond. In the 1890s, my great-great grandfather on my mother's side was a panday. He was a magsasaka and owned lots and lots of land. He made good, and was able to pass his fortune to his heirs. It only took one well educated kamag-anak in the 1950s to plan it for himself. As you can see Protectionism is in-born. It can be anyone, be it an individual or a country. Free-Trade. It is knowing what others don't. In the 21st century, lack of knowledge is not an excuse. Educate yourself, arm yourself with knowledge. Then it is up to you to keep everything for yourself or provide for others. "Be your own church. Keep not for yourself but that for the whole congregation. Keep your 10 percent and spread the rest, values and keeps, to others. Live what you can without." This is what I am protecting. What are you protecting? I am really curious on which side of the coin are you, when you are quoting Col Qadaffi and others, under your header, "What we Filipinos should know?." Create your own "Quote of the Day, Week or Month". There is ownership to it. All you need is one to claim. Once you have it, keep your 10 percent and spread the rest to others. I am notifying you as part of your condition, that I have linked your post "Developed/Rich Countries Came to Be...Protectionism..." of your Blogsite "The Filipino Mind" to my post "Patria". Thank you for your sharing. Likewise you can do the same with mine under the same conditions as that of yours. Let us share with our fellow Filipinos what we know, those past and present realities which we ought to know to understand ourselves and to be truly Filipino people; and act to have a homeland primarily for our native majority and a decolonized one.